Perfect for your take-out restaurant, cookout, party, gathering, or other catering event, this Visions white heavy weight plastic knife will exceed your serving needs! Complete your plastic cutlery setting, or use it to fill your flatware bins at your snack shack or concession stand. 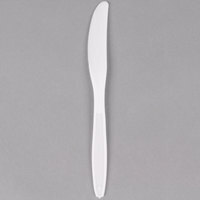 Made of durable polystyrene, this virtually shatterproof, disposable knife is strong enough to last through your meal service, and can be easily disposed of, making cleanup a breeze. This is a very nice heavyweight plastic knife. It is sharp enough to easily cut through meat, chicken, or fish without breaking. These knives are perfect for a less hectic clean up. The white also looks nice when matching with plates and napkins and they do not break easily like other plastic silverware. These are nice and strong knives. They're not too flimsy at all. You can use them to spread cream cheese or other dips onto bread and they don't snap. A basic white knife but with a strong feel to it. Its good for a lot of items, mostly desserts but you could get away with using it for other items as well, such as a tender steak. Excellent! As a family that often eats at home it's great to have these heavyweight plastic knives for our "heavier" meals (think cutting chicken without the knife snapping) and still save on clean up. Okay, these are truly heavy duty. strong enough to cut through our loaded sub sandwiches and for cutting our topping loaded salads in our deli. The medium weight version is a falsehood. those are actually very lightweight. Don't go for the cheaper version-- get these instead. WOW you can cut meat with this KNIFE. Thick, Sturdy very nice feel in your hand. A REAL DINNER KNIFE. Adding this to our reorder list. Visions heavy weight. Easy to use and clean up after the birthday parties or events is easy. They are a great buy! Well made for plastic silverware. I used these for my daughters shower and am using them again for a open house and will use again. These knives work well to cut food served at our church events that are no already bite-size for convenience. They do not break. The heavy duty quality works well. These are sturdy, disposable knives that hold up well to spreading cream cheese and or butter on toasted bagels. They're not flimsy and don't break easily like others I've purchased. These are the basic knife we use for off premise catering. They are thick and hold up well to dense foods. Far superior to similar priced disposables available from our distributors. These plastic forks are pretty good depending on what you want to use them for. They would not be good for steaks, but we use them for waffles and they work great. We tried the medium weight, but had to upgrade to the heavy weight. This know is a great sturdy knife. I am very picky about my plastic utensils and this one for sure passes the test! great value too! You can actually cut with these! We have these knives out for customers at our deli, but also cut brownies with them. Only plastic knife that will actually cut brownies! We purchased these knifes for our customers to use for the butter/ cream cream on the bagels. It is the perfect "heavy weight" plastic knife. It is not flimsy like others and allows our customers to enjoy their experience at our dealership just a little bit more. Used the Visions White Heavy Weight Plastic Knife to cut cold bbq pork meat. I took out of the fridge and would was easily able to cut the cold pork into easy bite size pieces. These plastic knives work perfectly. They are sturdy and do not break easily. The large quantity was exactly what we needed. Highly recommend this product! The Visions heavy duty Knife is heavy duty enough for most meals. I am a limited service cafe so plastic utensils is all I use. Amazing, strong and high quality. These disposable knives are great. We have one church that loves them and many other customers that are very pleased with the quality. I would highly recommend these!! Purchased these for a wedding reception along with the Vision Heavy Weight White Plastic Spoon and Forks. They are hard and sturdy and we have no issues with them. Only purchased a pack because not all guest used knives. I COULD NOT believe HOW STURDAY AND SHARP THESE PLASTIC KNIVES ARE. I CAN NOW BBQ AND KNOW THESE KNIFE WILL STAND UP TO THE JOB. We bought these for the guests to use at our 20th anniversary celebration. they worked very well for the chicken and steak sandwiches we had and i was very pleased with the quality. i would buy them again. The knives were a nice heavy weight and very sturdy. We used them daily on a week-long vacation and they held up well; I don't think any broke, which is usually common-place for plastic knives. I would buy them again. Super value. These knives hold up well, never have had one break. They look nice too. Great price for a quality product. Highly recommend them.